Since I first saw it in galley form several months ago I have been impatiently awaiting the [book’s] publication… Well, my copy just arrived in the mail. Defenders of the death penalty for certain heinous offenses need no encouragement from me to study this book, of course, but, from now on, opponents of the death penalty who do not address the arguments set out by Feser & Bessette really have nothing useful to contribute to the debate. Feser and Bessette’s defense of capital punishment is a triumph of truth over platitude, of fact over fiction, of argument over emotion. In response to recent condemnations of the death penalty issued by various ecclesiastics, Feser and Bessette calmly and methodically set forth the philosophical, Scriptural, doctrinal, and sociological arguments grounding the Catholic Church’s hitherto unquestioned – and ultimately unquestionable – support for the death penalty when it is justly administered. Defenders of capital punishment will find in these pages persuasive arguments upholding the proper exercise of this momentous state power and opponents of the death penalty will see their challenges accurately depicted and soberly answered. 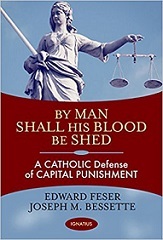 From this point on, all contributions to the capital punishment debate, especially as conducted by and among Catholics, must incorporate the work of Feser and Bessette or risk irrelevance. Joe and I thank Prof. Peters for his very kind words. If you’re not familiar with Prof. Peters’ fine blog, you should be. Interested readers can find other endorsements of the book at my main web page. Oh, it's out? Oh boy. Time to wait patiently for the tide of smug "thinkpieces" on Patheos Catholic to roll in from people who haven't even read it, vaguely bleating their moral superiority while addressing exactly 0% of your actual arguments. My copy should be arriving today. I'm excited to take a look. I'll try not to have too much fun watching the responses. I wonder if Mark Shea will read it and then invite you on his webcast to debate the issue? Will there be a kindle or audible version? If not, I'll go ahead and buy the paperback. "I wonder if Mark Shea will read it and then invite you on his webcast to debate the issue?" Ed can speak for himself of course, but my thought is the the less attention Shea gets the better. I'm worried about his (Sheas's) mental health. 1. We should not move to kill a person we love. 2. Christ asks us to love all people. (Including our enemies – and to not return evil). 3. Therefore Christ asks us not to move to kill anybody. And lest we forget, Christ is the Word of God. We should use our intellect to understand God better, and should be careful not to get so entangled with theorizing that the light of Christ is obscured. Should we fine or imprison people we love? (Isn't punishment also good? So how would it be repaying evil?) And maybe we shouldn't kill them, but what of a secular, or as with Rome, Pagan state executed someone? 1. We should not let dangerous criminals harm people we love. 3. Therefore Christ asks us to put some dangerous criminals to death. To fine people is good education. It serves to make certain that they do not profit from breaking the rules society establishes for the general good. We should imprison criminals when by doing so we protect the rest of society. But you don’t need to kill a criminal who is already in jail to protect the rest of society. Imagine somebody you love deeply and how you would agree the state behaved to her if she broke some rule (such as illegal parking) or committed some serious or dangerous crime (such as robbery or murder). That is the same way you should wish the state to behave to everybody else. Well obviously #3 doesn’t follow. You don’t need to put a dangerous criminal to death to protect the people you love from being harmed by her. Dianelos maybe you should read the book first. This seems like the most obvious of all possible counterarguments. I would be shocked if he didn't directly address it. I see a problem with your argument in premise 1 immediately. Why can't you kill someone you love? Sure we can't murder, but what about justice? I see a problem with your argument in premise 1 immediately. Why can't you kill someone you love? Sure we can't murder, but what about justice? " I doubt the book addresses it. I have the uneasy feeling that in the Thomistic mindset Christ’s core moral teaching is kind of suppressed. Thomists seem to not realize that since God is the metaphysical ground of reality, the basic fabric of reality is moral. The four causes and all other metaphysical principles of Thomism are secondary, and we should understand them only as a function of God’s love. And since we are made in the image of God our direct awareness of that love is more fundamental than intellectual reasoning. @ Tanner, VRS, and Sean: don't waste your breath. You won't be able to make any impression with reasonable arguments. Dianelos will be immune to points from the Bible - he will just refuse to credit those parts of the Bible, or something equally inane. You can't point out how the very same Old Testament books that gave us the Two Great Commandments also gave us God telling the Israelites to put murderers to death, and had God killing those who disobeyed him - these will be ruled out-of-order texts. You won't be able to press home with points from Catholic tradition: he isn't Catholic and hasn't any sense of how tradition applies in the Church. Philosophy will be useless, he will insist that what is important is God and philosophy just gets in the way. You cannot refer to reading the darn book, he already has a sense of what is in the book. By osmotic guesswork, or something. You can't use the testimony of the Doctors, he dismisses them as "secondary" and therefore irrelevant. He needn't understand the Doctors like Thomas, because of "metaphysics" and all that. Love is more important than anything, and as soon as you try to put any flesh and bone on "love" to give it context and meaning he will say you are getting away from the "point". All theology - no, all truth - is just "love" and only he can say what its content is, because of his interior light of grace that tells him so. I thought we finished with the theology of "there is nothing to explain, just love" once we left the 1970s behind, but I guess not. I wish he would go to the Vatican and have a love fest with Francis and leave us alone. The argument is flawed not because it is incorrect in itself, but because it does not take in account love on a broader context than just one person. In the death penalty the "love your enemy" still applies, because you are not executing him out of vengeance but out of need and love too. Punishment is also an act of love, and sometimes such punishment might warrant death. Mind you I think since we have good prison systems now, the death penalty might be obsolete, but that's another debate. "I doubt the book addresses it. I have the uneasy feeling that in the Thomistic mindset Christ’s core moral teaching is kind of suppressed. Thomists seem to not realize that since God is the metaphysical ground of reality, the basic fabric of reality is moral." Christ was not teaching Disney sugarcoated morality. You are absolutely correct that the Church has always maintained the right of the State to administer the death penalty. But so what? Should priests and bishops preach that from the pulpit now? Should the Holy See re-affirm the Church's support for the death penalty and should the Pope exhort world leaders to carry out more executions? Pope JP 2 opposed the death penalty. Even Pope Benedict, who did affirm the morality of the death penalty, went on to publicly support an organization that sought to end capital punishment. Pope Francis is also against it. As you know, centuries ago the Vatican once had its own executioner. It is now time for the Vatican to set up it's own lethal execution chamber? Maybe that would encourage Western European nations to bring back the death penalty. And while we're at it, let's bring back public hangings in the United States. Your book is just what the world needs for a worldwide revival of the death penalty. Doesn't capital punishment make much more sense in the nuclear age, when a small amount of people can destroy nearly if not the entire population? I obviously haven't read the book, and so I won't comment on it. I look forward to seeing it. b) The Church seeks the elimination of the death penalty. To say that something is permitted is not the same as saying it is mandated. Perhaps Mr. Feser addresses this in his book? I will be interested to see. I think Feser and Bessette agree with that, Fr. Martin. They don't think recent popes advocating the elimination of the death penalty are contradicting tradition; they think that they are making a prudential judgment about the application of the death penalty. Feser and Bessette argue against secular theorists and the new natural lawyers, who deny that the death penalty is sometimes permissible (and, in the latter case, that this is consistent with Church teaching and that your a) is false). In addition, they do argue that in our society, it is best to continue applying the death penalty in some cases, so they contradict recent popes' prudential judgments. Feser and Bessette also treat the report and comments of the American bishops, which they think are difficult to square with the tradition. They're generally worried that opponents of the death penalty slip into claims that seem to say that it is never permissible. So the Church affirms that the death penalty is morally permissible under certain circumstances, while also taking an abolitionist position with respect to the death penalty? Certainly, war has not been rooted out of human affairs. As long as the danger of war remains and there is no competent and sufficiently powerful authority at the international level, governments cannot be denied the right to legitimate defense once every means of peaceful settlement has been exhausted. So with respect to both war and the death penalty, the Church seems to be saying that while they are both morally permissible under certain circumstances, we should work for the day when they can be completely eliminated and abolished. I think that’s an excellent analogy. The Biblical quote of the title and other Scriptural support suggest that God's justice is satisfied by capital punishment for capital crime. Hence, a murderer who receives capital punishment can have hope of Heaven. St Catherine of Siena comforted the heart of a condemned man with this argument, reconciled him, accompanied him to his beheading, and cradled his head afterwards. Therese of Lisieux prayed for the conversion of a convicted murderer, asking God for it as a sign of His approval of her spiritual path. She was pleased to read that at the moment before his execution, the man snatched the crucifix of the accompanying priest and kissed it. I don't think the quote or the examples show that capital punishment for capital crime satisfies God's justice. If God's justice is satisfied, then that would suggest that the execution is sufficient for eliminating the need of further punishment, in the afterlife for instance. But unrepentant criminals don't avoid hell by virtue of being justly executed. But, per Feser's argument, capital punishment does seem to satisfy God's justice to the extent that humans can satisfy it. Humans cannot touch others' intellects and wills; human punishment generally just seeks to restore the proper order of pleasure, pain, and natural happiness. Greg, you are using "satisfies justice" in too simplistic a sense. For all punishments, if the offender resists it and hates being subject to it, the punishment does nothing at all toward satisfying the debt of punishment due to sin. Alternatively, if the offender accepts it willingly and in submission to it as God's will, it will expiate all or some of the debt of punishment due to sin. In this way, it clearly depends upon the will of the offender. But the state does not have the role of exacting satisfaction for sins against GOD, it has the role of exacting satisfaction for offenses against the state. In this role, precisely because the state does not have dominion over a person's will as God does, it is sufficient for the offender to be made to suffer the proportionate punishment, whether he accepts it willingly or not. In this role, that the state imposes something that is contrary to what the offender would will for himself, is what balances the injustice of the offender choosing to satisfy his own will rather than submit to the law. It is the sheer mechanics of his being made to suffer that satisfies. In the happy situation where the offender willingly accepts the state's punishment, he achieves a two-fer, that of satisfying justice for the state and at least in part making satisfaction for the sin against God. Whether he succeeds in making FULL satisfaction for the sin rests at least partly on the degree to which he willingly accepts it as his just deserts, but it is reasonably held that for the simple crime of murder (not aggravated by such additional evils as insurrection against the state), willingly accepting the punishment of death could be adequate satisfaction of the sin against God. No Catholic claims that it will or won't be adequate in any given case. In the case of a unrepentant murderer, state execution does not satisfy for his sin against God, precisely on account of his will remaining fixed in the sin. What hell does that execution does not do is provide a punishment suited to the one who permanently continues in hatred of God's will in the matter, the ongoing nature of the punishment fitted for the ongoing adherence to sin. Or, as St. Thomas says, the debt of punishment persists where the guilt of sin persists. The arguments that tie a state's punishment to satisfaction of sin on God's account are meant to deal with a different matter, that of (supposedly, as the claimed objection goes) cutting a man off from the possibility of repenting and making things right with God. It is true that execution does cut shorter the time available to the criminal to become repentant. It is not clear that this can properly be characterized as "not making possible the act of repentance", since (especially in these days) the criminal has typically at least 5 years during the process, and on average 10 years. It is unclear why a criminal who has had 10 years to reconsider his status and still refuses to repent would be more likely to do so with another 20 or 30. It doesn't take that long to reflect on your evil act - especially if you know when you are going to face God for it. It seems very disturbing for the Catholic faith that around the same time that it became legal to abort the life of the child in the womb, Catholic bishops began their opposition to the death penalty. My opposition to the death penalty is in practice, not in principle. There are too many cases where the death penalty is used arbitrarily, or in a partisan or discriminatory way, or where the state has forged evidence, for me to trust the state. Hey Prof. Feser, I just wanted to quickly ask whether this will become available on Kindle and other e-readers. I can't find it on the Kindle webstore so I'm hoping it will be there soon. Thanks! The Church hierarchy loses credibility when it lobbies for repeal of the death penalty. It is sanctioned in Scripture and in most of Church history, until recently. If it is wrong about this, what else has it been wrong about? Lobbying against death penalty NOW does not mean assuming the death penalty is always wrong. With the advancement of technology we can provide a prison system secure enough to contain any dangerous criminal, punish him and possibly rehabilitating him. Hence the death penalty does not become wrong but obsolete. Moreover even if it is still just to apply the death penalty, one might object that the good it does is outweighed by the evil of "wrongful death penalties" which mainly target minorities. Now whether these objections stand or not, it is possible to argue against the application the death penalty without necessarily asserting that the death penalty is always wrong. Dr. Feser, do you think Personalism has a hand in the denial of the legitimacy of the death penalty? I think it does.